Dr. Christopher Lawson has served as ALEPSCoR Executive Director since 2010. He previously served as ALEPSCoR Associate Executive Director from 2007- 2010 and ALEPSCoR Co- Director from 1999-2005. Dr. Lawson is a Professor of Physics at the University of Alabama at Birmingham, with a research specialty of optical sensing and nonlinear optics, and has published over 70 journal articles and 10 books or book chapters in these areas. 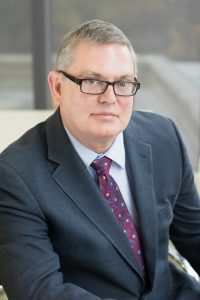 Dr. Lawson also serves on the Board of Directors of the EPSCoR/IDEA Foundation/Coalition, which assumes a leadership role in coordinating national EPSCoR activities. In addition, in 2013 Dr. Lawson was elected by the EPSCoR Coalition Board of Directors to serve as Vice Chair of the Coalition. As part of those duties, in March of 2013 (as well as previously in March of 2012) at the request of the EPSCoR/IDeA Foundation, Dr. Lawson testified in front of Congress in support of the NSF EPSCoR and NASA EPSCoR budgets requests. The ALEPSCoR Agency Directors provide oversight responsibility for the day-to-day operations of federal EPSCoR research programs in Alabama, including responsibility for coordination, notification and supervision of all EPSCoR announcements and awards issued by the federal government. An ALEPSCoR Agency Director is the administrative officer for a designated EPSCoR program in Alabama. He or she is appointed by the ALEPSCoR Steering Committee and is responsible for carrying out the administrative functions of the AESC, providing management, coordination and direction of the EPSCoR program in Alabama and for such other duties as assigned by the Executive Director and AESC. ALEPSCoR currently has an EPSCoR Agency Director for NSF, DOE, and NASA. The Agency Directors are accountable to the Executive Director of the ALEPSCoR Program and to the AESC for providing direction of the ALEPSCoR Program.